The first citywide recycling program debuted in 1995, and required residents to throw their recycling in special blue, plastic bags before throwing the bags in the trash. The website mybuildingdoesn'trecycle.com has gained about 1,300 reports since its launch in January 2015. Gordon Magill is president of Family Properties in Chicago. He says recycling is a net-positive for him financially. 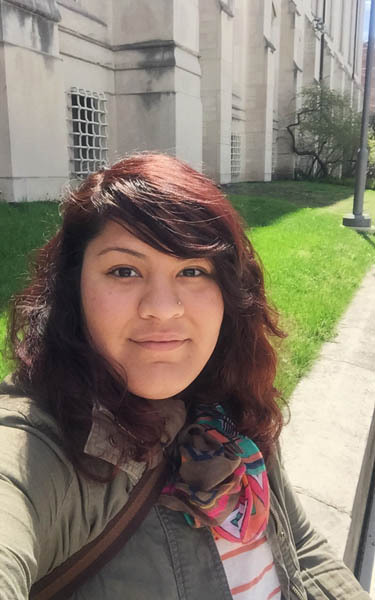 Our question asker Quetzalli Castro grew up in a Logan Square two-flat. Her parents still live in that house on Kedzie Avenue. Among the many fond memories she remembers from growing up there is the day they got curbside recycling. Since then she’s lived in several larger apartment buildings, but none of them has had recycling. “So I&apos;ve been caught trying to put my recycling into other people&apos;s recycling bins and they&apos;re like ‘Put it in your own!’ I don&apos;t have one. I wish I did! I have all this recycling and nowhere to go,” Castro says. The short answer is that the city has a two-pronged system for recycling: Small buildings with four or fewer units get one system (the blue carts and bins Castro remembers) and buildings with five or more units are supposed to set up their own systems through private contractors. But the real reason why Castro and perhaps hundreds of thousands of apartment dwellers like her end up throwing their recyclables in the dumpster is more complicated: It has to do with city politics, landfill economics and a toothless ordinance that has struggled to buoy recycling rates in large apartment buildings for 22 years. Quetzalli Castro is not alone. In January Claire Micklin left an Open Government Hack Night with an interactive website designed to identify and shame owners of large apartment buildings without recycling. She called it MyBuildingDoesntRecycle.com. Like Castro, Micklin reached out to the city only to find herself more confused — there was no recourse for building residents like her who wanted to recycle, but whose landlords wouldn’t provide the service. 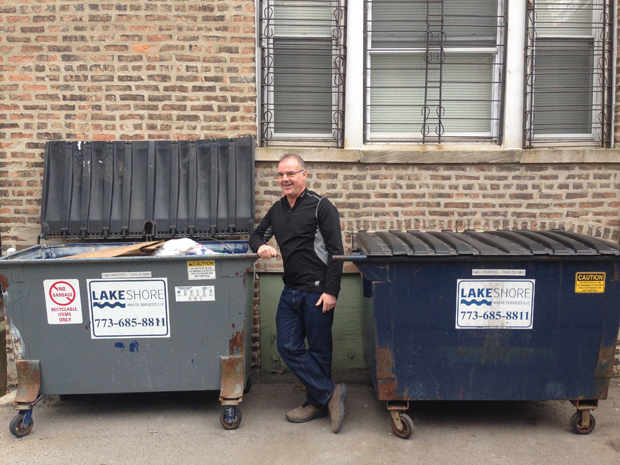 Micklin did a little more research and learned the city passed a law in 1993 called the Chicago High Density Residential and Commercial Source Reduction and Recycling Ordinance (more commonly referred to as the Burke-Hansen ordinance, for the aldermen who drafted it). The ordinance made owners of large apartment buildings (defined as having at least five units) responsible for their own recycling, because the existing requirements for garbage pick-up made the same distinction. The city gave multi-unit building owners until 1995 to establish programs that would collect at least two kinds of recyclables. By 1996 they were all supposed to collect at least three. If they didn’t, Chicago’s Department of Streets & Sanitation could issue fines to the building owners for $25 to $100 per day. But 22 years later it’s common to find large apartment buildings without any recycling service at all. Less than three months after her site launched, Micklin says nearly 1,300 people have reported 1,034 addresses through MyBuildingDoesntRecycle.com. The overall success of Chicago’s residential recycling program could depend on the participation of large apartment and condo buildings. More than 442,000 housing units (just slightly more than forty percent of the city’s total) are supposed to have recycling provided by landlords or condo associations. And, according to 2007 data (the latest available), these units account for more than a third of the solid waste collected from the residential sector. A key reason why many building owners appear not to have complied with the Burke-Hansen ordinance is that the city rarely enforces it. Records provided by Chicago’s office of Business Affairs & Consumer Protection and the Department of Administrative Hearings show that, since 2010, the city issued just 109 citations for not recycling in commercial or residential establishments. Why the lax enforcement? Burke-Hansen authorizes fines, but it doesn’t compel the city to actually issue them. Shiller says for condominiums and townhouses, it’s a slightly different story. There was a rebate program in place for any condo association that presented the city with an affidavit declaring the building had recycling. It&apos;s currently being phased out, and payments were typically delayed by as many as five years, but Shiller says that program once served as a “carrot” to complement Burke-Hansen’s seldom-used “stick” of warnings and fines. For apartment buildings, however, the regulatory environment is simpler. The city doesn’t tax recycling pick-up like it does trash, but apartment building owners never benefitted from an incentive program like condos used to. “In this case there seems to be neither a carrot nor a stick,” says Carter O’Brien, the vice president of the Chicago Recycling Coalition, a volunteer advocacy group. The Coalition has been working with (and sometimes against) the city since the early 1990s to improve recycling rates in the Chicago area. In some ways, O’Brien says, the city’s past efforts at recycling still haunt present-day operations. 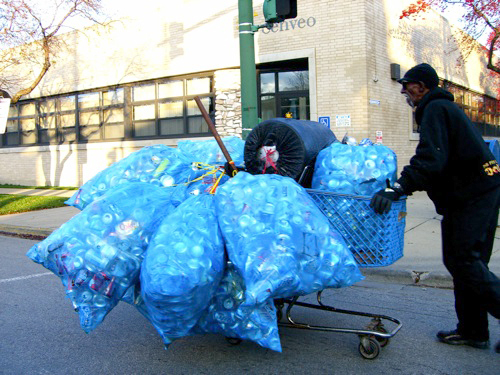 The first citywide recycling effort began in 1995, when Chicagoans were asked to buy special blue, plastic bags at the grocery store in which they’d put their recycling before throwing the bag in the trash. Recyclables were supposed to get sifted out at sorting facilities after that, but little of it did. The city canned the program in 2008. The irony for owners of multi-unit residential buildings is that recycling can be easy to implement. Sometimes it even saves building owners money. Gordon Magill is president of Family Properties, a company his great grandfather started more than a century ago. Family Properties now owns 15 multi-unit buildings on the city’s North Side and in the suburbs. Magill still has hundreds of blue bags stashed in a cupboard in his Edgewater office. He’s an avid recycler — he picked up a few soda cans off the sidewalk on our way to the dumpsters behind one of his buildings — but said the Blue Bag program was doomed from the start. Undeterred by its failure, however, Magill reached out to the company that hauls waste from his buildings and set up a recycling program. Magill says recycling is either a low-cost addition or a net positive for him financially, as he doesn’t have to pay as often to empty his building’s more expensive trash bins. He also cites recycling’s “commercial appeal to environmentally conscientious residents.” In other words: His tenants want it. Not all landlords are so zealous. Jim Thom, who owns a 14-unit building in Avondale, says he’d like to offer recycling to his tenants but can’t figure out how to make it work. His dumpster sits in a narrow gangway that runs all the way to the alley, leaving little room for another bin; the trash bin already pinches circulation between the stairwell and the building’s laundry room. And, Thom says, when he looked into recycling, he found it could bump up his waste pick-up costs as much as 33 percent, from $3,000 to $4,000 a year. He says he’s never been fined by the city for not providing recycling, and hasn’t heard of any building owners or managers who have. Josh Connell, a managing partner with Lakeshore Recycling Systems, says there are times when recycling just doesn’t make sense. “Those are the small buildings — your six-unit, 10-unit, even up to 25-unit buildings depending on the logistics and the space — it&apos;s difficult to recycle,” he says. Multi-unit residential buildings are a little less than half of Lakeshore’s business, Connell says, and he estimates four out of five of them order recycling along with trash pick-up. Larger buildings enjoy an economy of scale that can make recycling revenue-neutral, or even a net positive. But even though waste hauling is typically a minor item on a building owner’s balance sheet, any extra expense has to be justified. As evinced by the popularity of MyBuildingDoesntRecycle.com, a lot of multi-unit building residents want it. Recycling rates have been on the rise both nationally and in Chicago, and waste haulers like Connell say interest in their business is rising, even as the falling price of oil undercuts plastic recyclers’ bottom line. But is a more environmentally conscious public all it takes to forge a sterling recycling program? Probably not. San Francisco, Portland, Seattle and even New York City come up often in discussions of successful recycling programs. In 2012 San Francisco announced it had achieved 80 percent landfill diversion, well on its way to a goal of “zero waste” by 2020. It even has curbside composting to collect food waste and other organic material alongside bins for trash and recycling. San Francisco’s success is due to several factors — including a culture of conservation and clear, rigorously enforced regulations. But a simple number holds it all together: $151.47. That&apos;s how much it costs to dump one ton of waste in a landfill in the Bay Area. Figures are nearly as high on much of the West Coast. That number in Chicago is just $46, according to the city’s Department of Streets & Sanitation. In New York and along the East Coast it’s somewhere between the two, around $100 per ton. Connell says we should consider the dumping costs that are eventually passed onto building owners. “If they&apos;re paying twice as much to get rid of garbage, adding recycling could be an immediate positive impact on their bottom line,” he says. Still, Connell says he sees a lot more Chicago landlords coming around to recycling these days, in part because their tenants are starting to demand it. And if more buildings set up recycling, the cost borne by each one could fall, as waste haulers compete for business and are able to travel fewer empty miles between each pick-up. The societal benefits of cutting down on trash are myriad: Chicago trucks bound for the nearest landfill typically end up in Rockford or downstate Indiana, belching greenhouse gases all the way there and even helping clog up already congested roads. He says he’s wary of alienating landlords and businesses, but concedes that the owners of multi-unit residential buildings and small businesses have had more than 20 years to institute recycling since the Burke-Hansen ordinance passed. In other words, we don’t know if the situation our question-asker Quetzalli Castro asked about is getting better at all. And absent any plans to enforce the ordinance, she may be stuck in that situation, at the whim of her landlord. Quetzalli Castro, 26, is a determined recycler — she’s already doing it even though her building manager doesn’t provide the service. She says that impulse started young and hasn’t dwindled, even if her options have. A longtime Logan Square resident, Castro grew up in a two-flat on Kedzie boulevard and now lives in a multi-unit apartment building nearby. She was born in Mexico City, but moved to Chicago when she was just one year old. Right now Castro is a graduate student at the University of Chicago in their Urban Teacher Education Program, pursuing a two-year degree focused on education in Chicago. Castro is dismayed by the lack of recycling among many multi-unit apartment buildings. And she says learning about the city’s lack of enforcement adds another dimension to neighborhood development. Chris Bentley is a freelance journalist and reporter for Curious City. Follow him at @Cementley.